In Fine Jewelry > Agate Jewelry > Show & Tell. It still needs some cleaning but I don't want to over-do it. 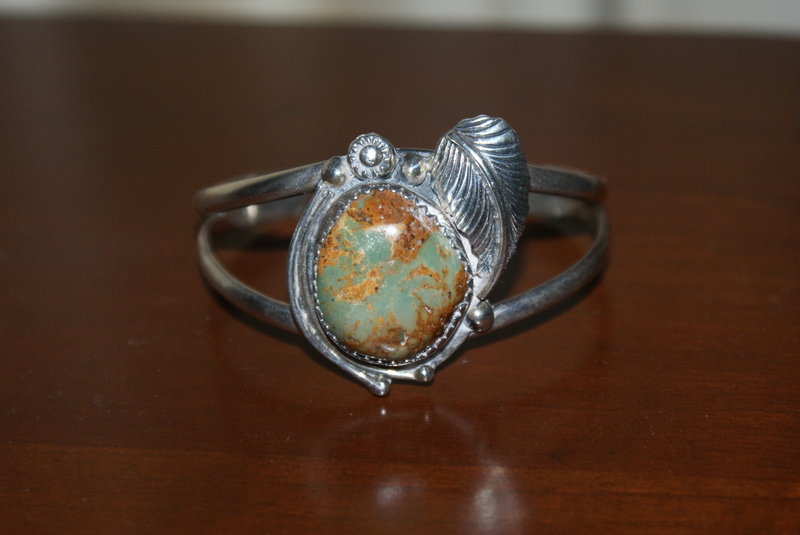 I like some patina on some jewelry. I think it gives it some "character", don't you think? I am not sure what the stone is. This is a lovely Arts and Crafts bangle, is the stone blue it could be Turquoise or is more of a green colour it could be Agate. Thanks a lot for your comment, Peasejean55:) I will look into your lead. Nice find! For me it looks native american with a turquoise matrix! Yes, Kyra is right on this one. This is great looking freiheit!! Hi freiheit. Yes, this is turquoise, a highly desired piece as well. It's from the Arizona, Nevada borders. You can take a toothpick to clean out the crevasses if you like. They will not scratch the silver or the stone. You'll want to remove all the cleaner from it. A soft toothbrush will help but won't remove everything. Was it Twin Rocks link I gave you? There's one I really like but I can't seem to find it. When I do, I will get back to you. Shareurpassion, thank you so much for your comments, information and the links. I will check them out as soon as I have a chance. When I found the piece, my first thought was that it could be Native American, too. But these items are rather expensive here and I am a bargain shopper. For that reason I thought it was just a pretty thing and I bought it. Since then I have started to read a bit about this kind of jewelry and I like it even more. 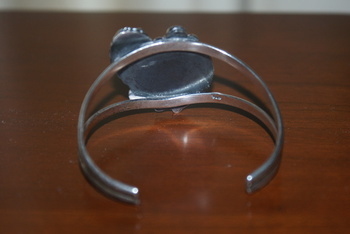 Among the reasons why I like it are the design, the fact that they are hand- made or mostly hand-made, and that they are easy to wear. I am a bit clumsy and I hate it when I break something. Now I got a problem: I would like to find more! I have seen a really nice selection in an antique shop but all of the bangles I liked where rather expensive. But enough complaining - I want to read your links now! Gorgeous bracelet! 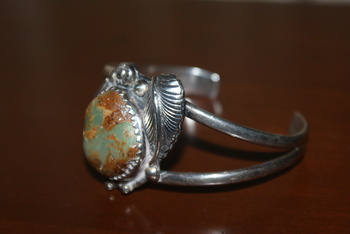 I would say it is definitely a Native American Turquoise and sterling piece. Here is a place I use to try to identify turquoise. It has a lot of the mines listed with examples of the turquoise found in the mines.